Enter this world and discover excitement far beyond your wildest dreams. Greyhawk is the place where adventure begins and ends?. This book is for experienced roleplayers looking from something exciting and original to use in their fantasy gaming. Its pages are filled with bold new gaming experiences. With this book, you join the ranks of the best role players in the world. Your search for glory and fame awaits the turning of a single page! For use with 1st and 2nd Edition AD&D. 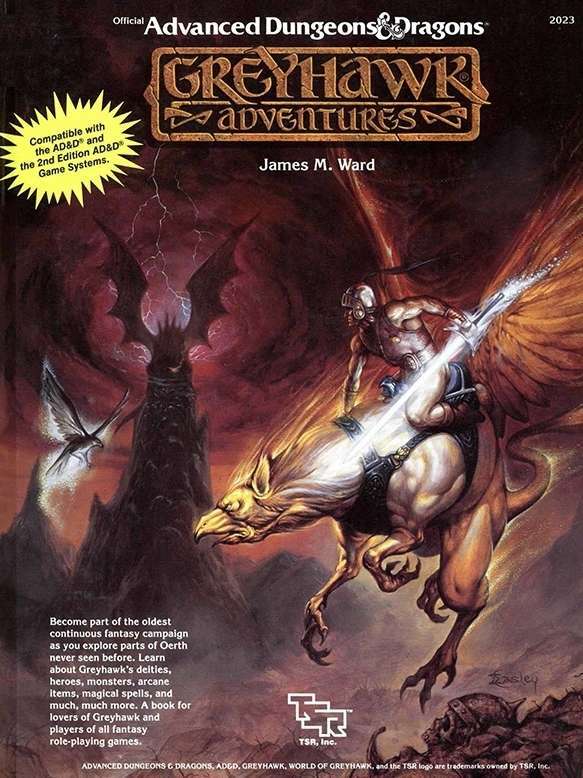 Greyhawk Adventures (1988), by James M. Ward, is the thirteenth and final hardcover book for the first edition AD&D game. It was released in September 1988. Between Editions. TSR announced the impending second edition of AD&D in Dragon #117 (January 1987). This put all products released after that date in some peril, because they might be deemed obsolete by buyers. In more recent years, Wizards of the Coast bridged similar gaps by producing setting material, adventures, or nostalgic products. By luck or by design, TSR did the same thing. Their final three hardcovers for 1e and their first non-core hardcover for 2e were all setting-heavy releases - something that TSR hadn't really done before in their hardcover line. Even Oriental Adventures (1985) had contained mostly character classes, spells, monsters, and other new rules, with just a touch of setting. To further bridge the gap, Greyhawk Adventures advertised itself as compatible with both editions of the game. When the book was sent to press, 2e was probably still in the final days of its 18-month playtest, but the game system was likely solid enough by then to make the claim 95% true. What's In a Name? The title "Greyhawk Adventures" was first used to brand Gary Gygax's Greyhawk novels, starting with Saga of Old City (1985). 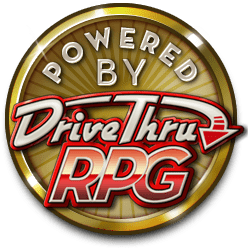 Meanwhile, RPG adventures were being branded with the "World of Greyawk" logo that originated with the boxed set (1983), starting with "WG5: Mordekainen's Fantastic Adventure" (1984) and ending with "WG7: Castle Greyhawk" (February 1988). After the Greyhawk Adventures hardcover was released, the rest of RPG books shifted to the new brand too, beginning with "WG8: Fate of Istus" (1989) and continuing through to TSR's demise. Amusingly, two of the other setting hardcovers released from 1987-1990 adopted the same naming style: Dragonlance Adventures (1987) and Forgotten Realms Adventures (1990) - though those books didn't contain any adventures and though the "Adventures" name wasn't used for the settings afterward. A Hodge-Podge. Of the three Adventures setting books, Greyhawk Adventures was the only one not written by the creators of the setting. It's probably because of this that Greyhawk Adventures feels very different from either of its kin. It's generally a hodge-podge of unrelated crunchy bits for Greyhawk, including deities, monsters, NPCs, spells, magic items, geography, adventures, and 0-level character rules. If the last seems an odd addition for a setting book, it's the result of Ward asking players what they wanted to see for Greyhawk in Dragon #129 (January 1988). Ward revealed the results in Dragon #135 (July 1988). Based on readers' request, he added short adventures and 0-level character rules to the book. More on Gods. Greyhawk Adventures was one of the first AD&D books to present a dramatically different view of gods. The descriptions of the gods here largely matched the format used by 2e books, including listings of allowed weapons and spheres. However, these gods don't have portfolios, nor do they grant special priestly powers (other than new spells) like deities would after 2e's publication. Greyhawk Adventures also offers stats only for the avatars of the gods, not the gods themselves, ending the decade-long ability of players to kill off deities as they pleased. More on Adventures. This was one of the few books from the era to present very short adventures without using the format from The Book of Lairs (1986). More on Zero-Level Characters. The idea of 0-level characters who hadn't yet picked a class was unique to first edition AD&D. It'd previously appeared in "N4: Treasure Hunt" (1986). Expanding Greyhawk. As the first major Greyhawk publication since Gygax's departure, Greyhawk Adventures is often credited with beginning the second major wave of Greyhawk production, which would run through 1990. About the Creators. James M. Ward was mostly working on gamebooks of various sorts by the late '80s. He was probably picked to write Greyhawk Adventures because he was one of the few employees who had survived the purges and layoffs of the '80s and still knew something about Gary Gygax's original Greyhawk game. He'd later say that he and others also helped to give products like The City of Greyhawk (1989) and WGR1: Greyhawk Ruins (1990) the feel of Gygax's original game. I doubt that WotC any reads any of this, but I would love to see all of these AD&D1e orange spine books available as a soft cover PoD.